Be the first to share your favorite memory, photo or story of MSgt Stewart. This memorial page is dedicated for family, friends and future generations to celebrate the life of their loved one. MSgt Stewart C. Yeomans, USAF Retired Flight Engineer/Instructor/Flight Examiner made his last flight on March 27, 2019. He was born in Moultrie, GA on April 13, 1927. Stewart loved and was dedicated to the U.S. Air Force for all the opportunities it offered him. He was very proud of his service as a crew member on C-124 and C-133 aircraft at Dover AFB. 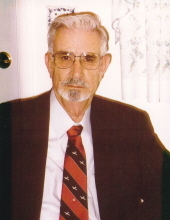 His distinguished and dedicated service included Korea, the Cold War, Vietnam, and Humanitarian Missions to the Congo, Airlift and Chile Earthquake, recipient of the Million Miler Certificate of Achievement in flying more than one million miles over the world’s airways as a crew member of the USAF. He was a member of the crew that flew the last C-133 to be retired from Dover AFB. After retirement as a Master Sergeant in 1971, he learned how to repair televisions and opened Stewart’s TV Service. He also served as a signalman for Conrail and delivered newspapers for USA Today. He was a serious, stand-up man, a hard worker, a good provider who loved his family, encouraged and was proud of their accomplishments. .
His interest in airplanes continued as a member of Kent County Aeromodelers Club, building and flying Radio Control airplane models. He received the KCAM Modeler of the Year three times. He had served as the Club President and was the Club’s longtime Newsletter Editor. He was involved in establishing a permanent flying field and organizing the Club’s Annual donation to Home of the Brave and Toys for Tots. He enjoyed gardening, boating, and fishing, home improvement projects, Broadway musicals, travels with family, music and dancing. He respected nature, showing genuine concern and loving care for his dogs, all wildlife, and the environment. During his later years, he enjoyed watching the wild life on his property especially the blue bird’s build their nests, keeping a close watch over their births and wellbeing. Stewart was preceded in death by his parents, Annie and Arrie, beloved toddler sister Dorothy Lee killed in a car crash where he was also a young passenger, brothers Frank and Jack, sister- in-law Nancy Stroup and his devoted dog Kirk. He is survived by his wife, Bonnie his son John & wife Cindy, grandchildren Brittany, Jordan Tyler and Garrett Yeomans, sister Wilma Theis, sister-in-law Dale Yeomans, brother- in- laws Jim Stroup and Roger Gilman, his dog Laddie and numerous nieces and nephews. Funeral services will be held 12 Noon, Wednesday, April 3, 2019 at Torbert Funeral Chapels South, 1145 E. Lebanon Road (Rt.10), Dover. Friends may call one hour. Interment with full military honors will be at the Delaware Veterans Memorial Cemetery, Millsboro. In lieu of flowers, please donate to the Brandywine Animal Shelter, 600 South Street, New Castle, DE 19720 or Air Mobility Command Museum, 1301 Heritage Rd., Dover AFB, DE 19902-5301. To send flowers or a remembrance gift to the family of MSgt Stewart C Yeomans, please visit our Tribute Store. "Email Address" would like to share the life celebration of MSgt Stewart C Yeomans. Click on the "link" to go to share a favorite memory or leave a condolence message for the family.